By WestEd and Intelligent Automation, Inc. Description: As part of an NSF-funded project, WestEd and IAI are developing two games to serve as formative assessments for an existing SimScientists middle-school curriculum that includes simulation-based embedded assessment activities. The SimScientists Food Web Game focuses on construction of a food web from evidence collected about interactions between organisms. The SimScientists Population Game builds on the Food Web Game, focusing on population dynamics and evidence collected to support explanations of predation and competition. In each game, the player alternates between collecting evidence in a virtual world (an African desert oasis) and developing models of the ecosystem. The player works collaboratively with virtual peers, a scientist, and a wildlife manager. In the Food Web Game, the player and virtual peer travel through the oasis in a jeep gathering clues (by taking pictures) about the interactions between organisms in the ecosystem. Then they use these clues to construct a food web as a model of the flow of matter and energy in the ecosystem (with help from the virtual scientist if needed). 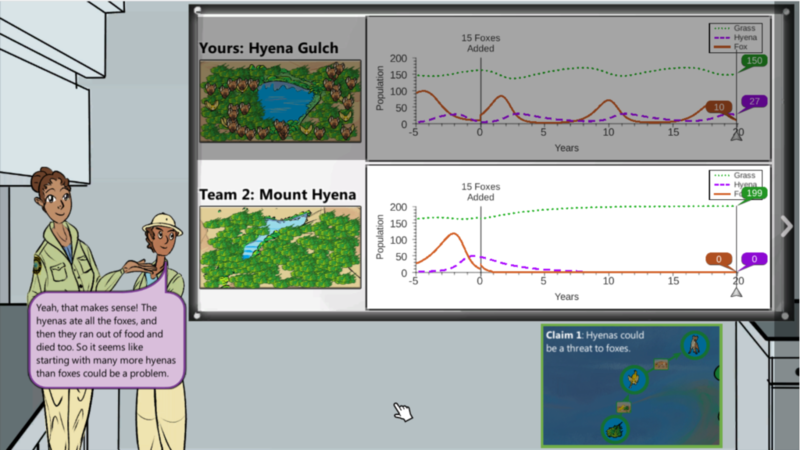 Upon completing the food web, the virtual scientist and peer engage the player in explaining the interactions and flow of energy and matter through the ecosystem, making predictions about potential threats to the survival of the fennec fox, and supporting their predictions with evidence and reasoning. In the Population Game, the player and virtual peer work together to restore the fox population in an oasis, fly drones to collect evidence on the population changes (by gathering data from “tags” on the organisms), and reason from the evidence to explain predation and competition between organisms. The game also provides opportunities for collaboration with the virtual scientist and peer (seeking advice, offering advice, and acting on advice). This game-as-assessment will be inserted into an existing ecosystem curriculum unit following an embedded simulation-based assessment that generates a Student Progress Report on the same core ideas and science practices. Goal or Challenge: In the Food Web Game, players try to predict which organisms in a desert oasis ecosystem might be a threat to the survival of the fennec fox. To do this they alternate between gathering clues in the oasis and using the clues as evidence in a food web “puzzle” that represents energy and matter flows in the ecosystem. In the Population Game, players use the predictions from the Food Web Game to make decisions about how to restore the fennec fox population. To do this they alternate between gathering data in the oasis and using the data in a population model, and compete with a virtual team of researchers restoring the population of a different oasis. Collaboration between the player and virtual peer is supported with an in-game chat tool. The peer can offer advice and the player can seek assistance. A virtual scientist and virtual wildlife manager engage players in developing evidence-based explanations and arguments about the ecosystems. Primary Audience: Middle school students (grades 6–8) in a science class that includes ecosystems in the curriculum. Assessment Approach: The SimScientists Games employ Evidenced-Centered Assessment Design to specify game activities that will elicit evidence of the ecosystem core ideas and science practices and capture player actions to use as evidence of understanding and application of science practices and knowledge. Some player actions are interpreted by the game logic to provide feedback to the player. Most player actions are recorded in logs and interpreted by diagnostic variables in the evidence model, which in turn provide values to update nodes in a Bayesian Estimation Network (Bayes Net). In classroom use, the Bayes Net returns an updated probability estimate (updated from the initial assessment done in class) that the player understands the targeted core ideas and can apply the science practices. Output of the Bayes Net provides teachers with a summary of student understanding, including areas of strength and weakness.